Koenig: "No one could throw it in the ocean most of the day"
Koenig: "(RU D) had an extra gear tonight." Badgers had 15 turnovers. Happ: "special thing to play at MSG...amazing how well (UW fans) travel." Happ: I walked off the court and looked around and appreciated how well our fans travel. That was something special. I savored the moment. Gard: "(RU) tries to...force you to take tough shots." Gard: players didn't rattle, didn't panic. #Badgers made 11 of final 14 FGAs. Gard: "Our guys found a way." #Badgers we're just 9-for-46 prior to that. Gard on Hayes: he delivered in OT. Wants him to be more aggressive from the start. Ugly, ugly offense for most of game for #Badgers but curious to see if this victory pays dividends later. Gritty. To summarize: #Badgers ' victory a 1 on beauty scale and a 10 on grit scale. Sort of like this reporter. ???? Pikiell (RU) - "We have to learn to finish off games...(FTs) our achilles." Pikiell: We don't shoot free throws well. A nine-point lead is not really a nine point lead for us. Gophers lead Maryland, 33-26, at half. 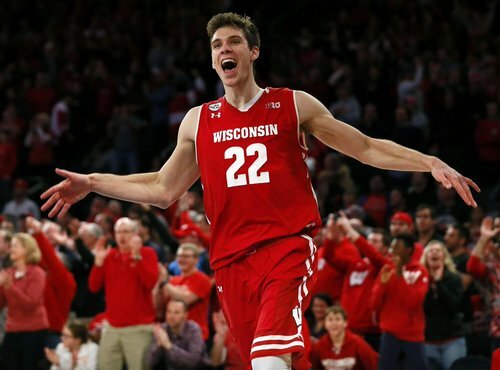 If lead holds, #Badgers will be in sole possession of first in B1G. #Badgers hit 5-25 FGAs in first half, 10-29 in second and 5-6 in OT. ...and winning is fun. ???? #Badgers Koenig: Nobody could really throw it in the ocean today for most of the game. Announced crowd for #Badgers -Rutgers was 8,531.